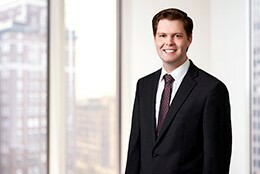 Chris Brassfield is an associate in the Antitrust group in Axinn’s Washington, DC office. Chris was a Summer Associate with Axinn in 2017. His practice involves merger investigations, merger analysis and antitrust counseling. He has advised clients in industries including life sciences and chemical manufacturing. He received his JD from The George Washington University Law School and a BS in Economics from Brigham Young University.